IT really doesn’t matter that so much of the dish on “The Heat” is cool. So, what? It is predictable, formulaic and coarse. Melissa McCarthy sprays her surroundings with the f-word as if she is passing out business cards at a sales convention. Yes, all of that foul language is tiresome. Sadly, the film lacks too many genuinely funny moments. But it’s summertime and the livin’ is easy, so “The Heat” gets a pass. This is a perfect film for the weekend before Independence Day weekend. (See video above). What really matters, though, about “The Heat,” which opens nationwide today in the United States and also stars Sandra Bullock, is that it is a female buddy film, almost a rarity in Hollywood. Just as important is that its protagonists are two women who don’t engage in ugly who’s prettier politics. 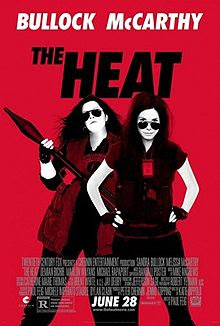 "The Heat" is rated R for pervasive language, strong crude content and some violence; visit http://www.theheatmovie.com/ to learn more about the film.